The Episode starts with Purva getting a call from Shishir Dwivedi, an event management company owner who offers her job. Sh says she will do the job. He says he will send the details and the dress code. He sends her dress code pic. Sumiti hears her and goes. Purva thinks that’s why I don’t like joint families. Gomti takes selfies while going out. Sumiti asks where is she going? Gomti says temple. Pankhudi asks herself to go to hospital with Dr. Vedant from tomorrow, sitting on his bike. Sanju comes and admires her. Pankhudi sees him and asks him to study. Sanju says he wants to pass, but Papa wants him to fail because of the deal with Vedant. He says he has tear all his books. Pankhudi thinks she can’t let Vedant lose and asks sanju to pass for her. Sanju promises her to become a good doctor. Pankhudi thinks my Vedant can never lose. Vedant checks the CCTV footage and sees the mechanic who compromised with the wires with Gomti. Pankhudi comes there and tells Vedant that Gomti bua did that on Ramesh’s sayings. Vedant says you must have told me. Pankhudi says I don’t want to hurt you, and hugs him. Vedant says it is okay. Rashmi comes there and sees Pankhudi and Vedant have a hug and get shocked. Gomti meets a young guy who praises her. She tells that she talked to her brother about their marriage. The guy gets tensed. She comes home. Vedant asks Gomti about the mechanic with whose help she tried to harm Purva. Ramesh tells that the man was Bittu, an OPD Patient. Vedant says there was no entry. Ramesh says I will not be proved wrong. Mechanic comes there and accepts his doings. He tells that he did that on Gomti’s orders for money. Vedant asks him to go. Dadi tells Ramesh that he has shown enmity on his father’s birthday and Vedant saved him from Police. Ramesh says we have done so many favors on him, and says even a dog shakes his hand after eating the food. Dadi slaps Ramesh. Vedant says Dadi. Ramesh asks him not to interfere. Gomti bends down before Dadi to get saved from punishment. Ramesh asks Vedant to leave from the house. Dadi asks can you run the house and take care of everyone and the kids education expenses. She says if Vedant leaves then you will lose customers also as they trust you because of him. She says Vedant will not leave. Ramesh says I will trouble you a lot that you will go. Sumiti tells Narendra about Gomti’s affair. Narendra gets tensed. Vedant tells Purva that he wants to talk to her about yesterday’s party. Purva says even I want to tell you and tells that Dwivedi offered her a job and send uniform also. He says uniform. She shows the pic. Vedant asks her to go to office and wear it. He asks her to say yes and says I will handle everything. She signs him thank you. he smiles. Gomti tries to cheer up Dadi. Dadi asks her to say truth and asks where she went and with whom. Gomti says she met her true lover and asks her to get her married. Dadi says if you do the same thing there. Gomti shows her Preetam’s pics. Dadi says he is much younger. Gomti says age is just a number in love. Dadi calls Vedant from Gomti’s phone and asks him to enquire about the guy. Vedant says Bua has the right to get the happiness. Ramesh gets angry knowing Dadi asked Vedant to enquire about preetam and asks her to make him meet him first. Just then courier guy comes and gives the uniform. Gomti checks the uniform while Ramesh checks appointment letter. Ramesh asks Purva if she didn’t have the respect for the family. Purva says you shouldn’t have opened it. Ramesh says this house bahus can’t do job. Purva asks do you regard me as your bahu. Ramesh says no, but you stay here. Purva says when you can send your house respect to jail then why not to work. Ramesh tries to slap her, but Purva holds his hand and says she can get him arrested with just a small phone call. He rubs his shoes on her uniform. Purva says I will do this job. Ramesh challenges to kick them out in 38 hours. Precap: Ramesh tells Vedant that he met Preetam and his mum. He tells that Preetam’s mum refused for the alliance as Purva does job. Vedant says he wants to meet Preetam and wants to hear him, and if he says the same then purva will leave the house. 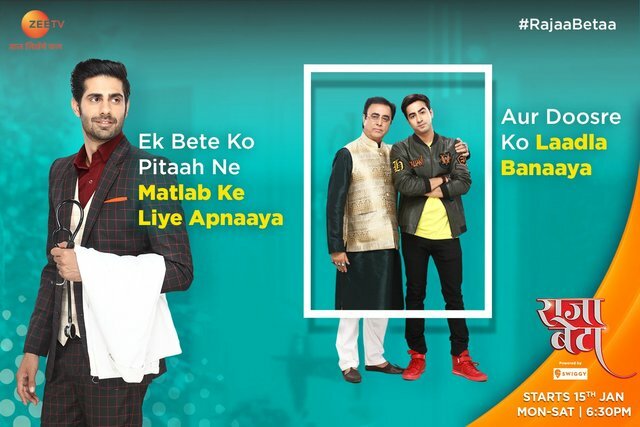 The post Raja Beta 25th February 2019 Written Episode Update: Vedant confronts Ramesh for trying to electrocuted Purva appeared first on Telly Updates.